Are you hesitant about implementing workforce management? Do you think it will cost too much? This is understandable. After all, the Human Resources department isn’t a revenue generator. But that doesn’t mean that your staff can’t boost the bottom line by cutting labor costs. 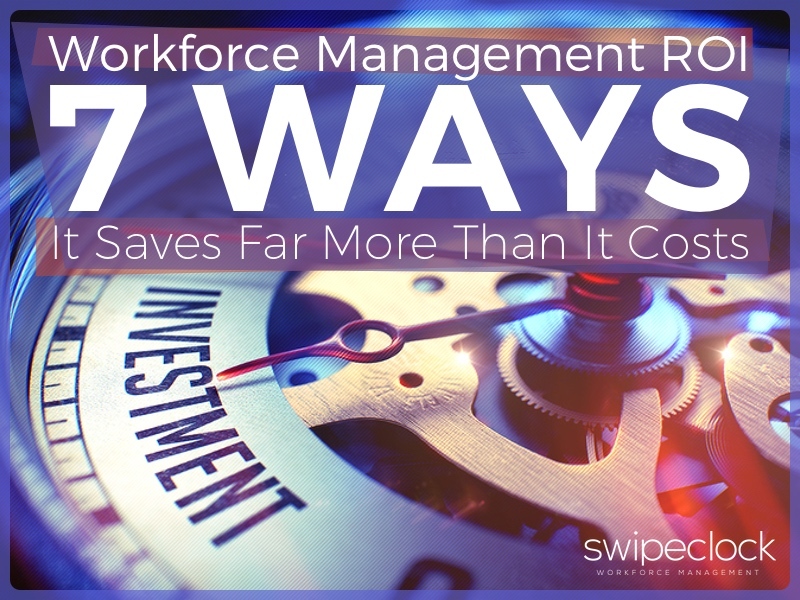 Workforce management software saves money and streamlines workflows. There are no downsides. With manual time and attendance systems, your managers spend hours troubleshooting time card problems. These include missing shift start and end times, indecipherable writing, and math errors. Managers with workforce management software can approve time cards at a glance. Because the punches are captured automatically, there are no paper timesheets to deal with. With a WFM system, you don’t need a large HR team. The system does the calculating and the tedious data entry. Some businesses with around 50 employees can get by with just one Human Resources or payroll administrator. Some workforce management systems have tools for onboarding and benefits enrollment. Plus employee engagement and performance reviews. Each tool provides additional administrative savings. It also makes your admin staff’s jobs a lot more enjoyable. If you haven’t caught any of your employees fudging on their time cards, you aren’t paying attention. In a survey of over 500 retail and service industry employees, over 30 percent admitted to time theft. Two common methods are buddy punching and recording incorrect start and end times. Buddy punching or buddy clocking is a flagrant act of time theft. It occurs when an employee clocks in for an absent co-worker. It can occur in workplaces with lax supervision and honor-based time and attendance. Mobile or offsite employees can easily commit wage theft if supervisors can’t verify punch times. Employees also commit time fraud by clocking in early or clocking out later than authorized. They can also stay on the clock for unpaid breaks. Buddy clocking and time card padding result in an average of 4.5 hours overpaid per week, per employee. For one employee working at $10 per hour, that is a loss of $45 per week. A biometric time clock eliminates buddy clocking onsite. It is virtually impossible to fake a biometric time clock. It confirms identity with a unique biological identifier. (If you had an employee who could beat it, they would probably be working somewhere else.) WFM mobile apps with GPS keep mobile and offsite employees honest. When workers get shorted on their paychecks, you’re in a world of hurt. Mistakes frustrate your employees and create hassles for your HR team. They can also result in a costly penalty or lawsuit. In the past five years, employers paid more than 1.2 billion in back wages due to payroll errors. WFM software protects you from losing money due to payroll errors. Businesses that mismanage overtime for hourly employees put a strain on their labor budget. Manual systems don’t have built-in warnings. These alert managers when employees are approaching overtime. The larger your organization, the more unplanned overtime costs you. WFM systems with customizable overtime alerts can save small businesses thousands every year. With WFM systems, HR can process error-free payroll in minutes. Then they can work on things that improve productivity. Or lower employee turnover. Or improve training. Either way, everybody wins. Scheduling is at the heart of human capital optimization. Workforce management lets you avoid over- or understaffing. Both of these problems cost you. Understaffing creates poor customer service. It also leads to employee burnout. Overstaffing inflates your labor budget. WFM analytics let you optimize scheduling to meet budget goals. Inaccurate timekeeping contributes to dissatisfied employees. This, in turn, leads to higher turnover. Many employers don’t realize how expensive it is to replace an employee. It costs about 20% of annual salary to replace a worker making less than 50k a year and the costs increase with higher paid employees. Do the math: for a staff member making $30,000 a year, that would be $6,000. WFM systems with employee self-service portals also create happier employees. Employees can access their time card and schedule online. Any time of day. At home, at work—or anywhere in between. They can check their PTO accruals, fill out tax forms, and update their personal information. Online shift trade boards are a game changer when it comes to employee job satisfaction. When an employee needs to swap a shift, he doesn’t need to go through a manager. Schedule flexibility creates loyal employees. Experienced employees are more productive. Ka-ching! Employers with a plan are twice as likely to meet their labor budget goals. Industry experts assert that companies who don’t have an absence management plan lose almost $800 annually.